The Observer Effect is this strange physics principle that says the act of observation alters the outcome when observing phenomenon. The same principle can be applied to people and animals to an extent. So what happens when a brilliant scientist discovers a way to travel through time so that history can be observed and recorded? 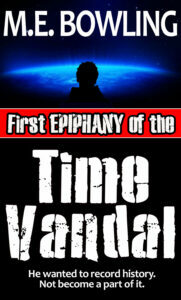 Dr. Elijah Snow learns that time travel is far more complicated than the science that made it possible as he starts his journey toward becoming the Time Vandal. As a general rule I am not a big fan of time travel in books and movies. too much time and effort is spent on avoiding paradoxes and alternate timelines and on and on. Sometimes it drives the story, but all too often I find that it bogs the story down or opens up gaping plot holes. Very early on in First Epiphany of the Time Vandal the reader is assured that none of that baggage will be included here. The approach to time travel is straight forward and makes way for the story itself to take center stage. This alone makes the book worth reading. When you add in the quick, but unhurried, pace, the memorable characters, and clever plot, this is a rare gem of a first outing by an author. The one problem I had with the book was that outside of the main three characters the rest were treated as mere window dressing. Don’t get me wrong, not every character needs to have a full backstory and granular detail, but there were a couple of characters that played important roles in the story but they were given short shrift through most of the book. It is an opportunity missed by the author, but only a minor flaw in an otherwise excellent book. With summer approaching I would definitely consider grabbing this one and giving it a go. It is a quick, gripping read that will leave you hungry for the next installment (which the author assures me is in the works). I would definitely recommend this book to anyone interested in history, time travel, or science fiction. M. E. Bowling spent most of his childhood years shuttling between various Air Force bases in Europe and the United States. As a child in a military family, he attended 12 different schools before he was 14 years old. This experience helped him gain a unique perspective on the ways that peoples and cultures vary from place to place. He is currently crafting the follow-up to Time Vandal and has outlined a third novel ‘Mary’, a fictional account of the life and death of the Indian circus elephant that was hanged from an industrial crane in a small town in Tennessee in 1916.